Your role as a driver has changed greatly since the current HOS rules were introduced.A greater focus has been placed on enforcing compliance by the DOT. So how do you stay ahead? 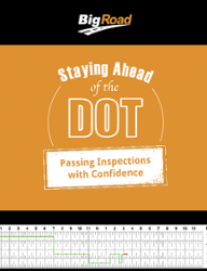 The only effective way to stay ahead of DOT is to make sure you have the confidence to pass roadside inspections. There are no shortcuts in safety and compliance. You need to do things right the first time. Luckily, this isn’t as hard as it sounds – you already have the necessary tools at hand. In this eBook, we’ll show you the kind of things DOT inspectors are looking for and demonstrate the simple measures you can take to improve your safety and compliance. We encourage you to share it with your fellow truck drivers and hope it gives you the confidence to pass any roadside inspection. Fill out the form and you can download your copy of Tips to Stay Ahead of the DOT for free.